Like many of our Ambassadors, C.A. Richardson learned to fish in the great state of Florida, honing his angling skills in Tampa Bay. The native Carolinian moved to the Sunshine State when he was young and spent his childhood and adolescence luring snook, tarpon, and redfish onto the line. It was the jumping point for his professional ambitions and C.A. took to fishing competitions throughout the 80s and 90s. With some regional success under his belt, he decided to go pro and started competing across the country, eventually returning to Tampa Bay to launch his inshore guiding company. 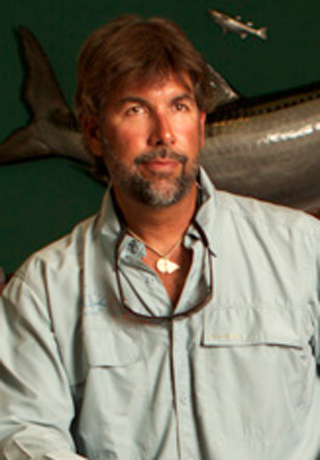 Through guiding, he saw a need to educate anglers on advanced inshore fishing skills and the use of artificial lures. This led to the development of C.A.’s notable Flats Class, a traveling fishing school. The class quickly earned him notice and became the inspiration for Flats Class TV. Since its debut in 2007, Flats Class TV has won two industry awards and is annually nominated. Currently, C.A. has dedicated himself to returning to flats fishing, expanding the Flats Class series, and continuing Flats Class TV. He resides in St. Petersburg, FL with his family. When I wake up in the morning the only thought I have is to fill my Rambler with some black coffee! My favorite place to fish has and always will be the Everglades in south Florida. Its versatile and remote. If you could improve on anything what would it be? It would have to be how could I include more writing and photography, believe it or not. I'm so busy living the dream, I often forget or get too busy to chronicle the memories in a manner that I would like to share one day. I've got a few heroes in our sport that have inspired me to reach my potential. Anglers such as Flip Pallot, Chico Fernandez, and the late José Wejebe all have influenced me to protect and educate others about the environment as well as the tradition of fishing the shallows. The sound or noise I love the most is the whooshing of a tarpon rolling at sunrise giving his position away so I can deliver a well placed plug into the zone! My day job if I weren't a professional angler, likely would be something to do with the outdoors: scuba instructor, or something in the boating industry. I grew up salty so it's hard to imagine I'd ever be trapped in an office, for sure. If I could fish with anybody, it would likely be Flip Pallot even though I've fished with him many times now. Mostly because I learn so much about the history of our light tackle sport plus he gives me that Yoda-like guidance that I'm looking for on how to navigate through my career. He's a great mentor and teacher.